Volatility in the energy markets directly impacts equity, fixed-income, currency, and commodity markets. 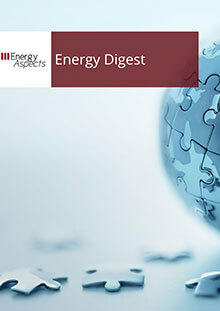 The Macro Energy service from Energy Aspects offers a specific focus on how energy prices are being driven by supply and demand fundamentals and geopolitics, and how that in turn will feed into risks and opportunities across a whole host of markets. Crude traders have been grappling with conflicting signals all week as rising tensions across the Middle East have brought geopolitical risk back into the equation just as Brent fundamentals are softening. Brent spreads, which had been persistently bid over the past two quarters, have stalled, in..
WTI, which has been trying to follow Brent to reach its own new highs this year, is very much at an inflection point and has struggled to break higher. This week has been more about consolidation, despite continued impressive stockdraws in the US, a major disruption to Iraqi exports out of T.. When will WTI go backward? It has been so long since the WTI crude curve has been in an outright backwardation that we don’t blame people for thinking it might stay in congtango forever, especially given the persistent discrepancies in the respective shapes of the Brent and WTI crude curves over the course of the las..
A few weeks ago, we asked if the market was becoming complacent. After all, human beings are susceptible to conditioning, and this year the market has been conditioned to believe that selling volatility is a winning trade, and until proven otherwise, that is exactly what the market will do. Speci..